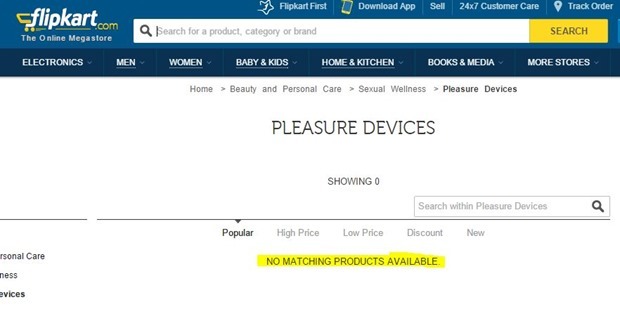 Exactly an year back Flipkart started offering Sexual Wellness products on its platform to the users. However, barely 12 months after the launch, they have decided to remove all products listed under Sexual wellness category, except condoms, which are still available. In a letter sent to all their sellers, Flipkart has said, “Current listings under this category will not be visible to customers with immediate effect” . So if you search for any items categorized under Sexual Wellness, you will not be able to see it on Flipkart anymore. Sexual Wellness products is a Rs. 1000 crore market and it is growing at a healthy rate, however, Flipkart looks to have taken this as a precautionary step after police received an e-mail complaint about four ecommerce sites, including Flipkart. The complaint stated that these sites were violating the law by “openly promoting and selling objectionable products illegally and showing objectionable content on their websites”. While there is no report of Police taking any action on the complaint, Flipkart seems to have taken the safer route by removing the products from their platform rather than get into any legal hassles. There is another reason as well – Government is closely watching ecommerce sites now. Earlier this month, an FIR was launched against Snapdeal by Maharashtra’s Food & Drug Administration (FDA) agency for selling banned drugs. Based on this FIR, Snapdeal premises were raided by FDA authorities. In India, there are still a lot of legal gray areas as to what can be sold under “Sexual Wellness Category”. Although, there have been lot of ecommerce startups like Shycart, Ohmysecrets, imbesharam and others that have come up in India specifically catering to this vertical, moral policing has been a big issue for all of them. Now, with Flipkart removing such products from their store, it might boost sales for other ecommerce startups, but at the same time, they will always be on the edge in regards to what can be sold and what cannot be.